Beautifully crafted this 1950's ketoh features an incredible array of stamping with several areas of raised repousse work. 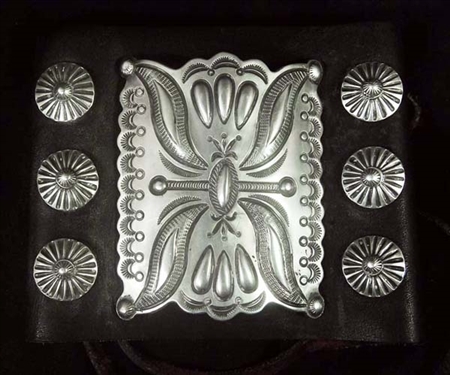 Heavy silver used adding substantial weight to this great piece. The Navajo as a form of wrist protection originally created the classic ketoh for hunter. It would guard the lower arm from being hit by the bowstring once the arrow was released. This aged bow guard is in very good condition. 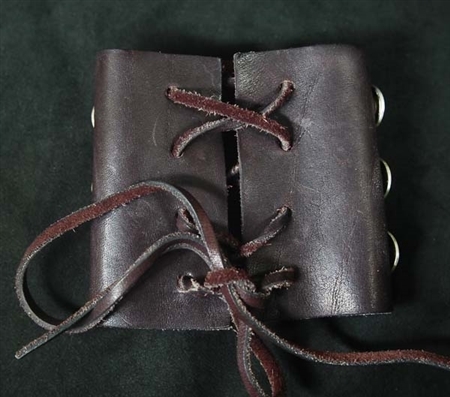 Bow guards are now worn by both men and women as bracelets. The leather band shows some wear. The leather portion of the piece measures 3 1/2" wide x 8 1/4" long, with the silver portion measuring 2 7/8" long by 2 1/4" wide.